يشكل فندق منتجع ذا ويف بموقعه الممتاز في قلب برود بيتش نقطة انطلاق ممتازة لاستكشاف جولد كوست. يمكن من هنا للضيوف الاستمتاع بسهولة الوصول إلى كل ما تقدمه هذه المدينة النابضة بالحياة. يوفر الفندق بفضل موقعة الجيد وصولاً سهلاً إلى أهم معالم المدينة.
. إن حسن الضيافة والخدمات الراقية التي تعرف بها Dreamtime Resorts تغني تجربتك في منتجع ذا ويف. إن واي فاي مجاني في جميع الغرف, تسجيل وصول/خروج سريع, تخزين الأمتعة, واي فاي في المناطق العامة, صف السيارات هي جزء فقط من الخدمات التي تميز منتجع ذا ويف عن باقي الفنادق في المدينة. استمتع بوسائل الراحة الراقية في الغرف أثناء إقامتك هنا. بعض الغرف تتضمن تلفزيون بشاشة مسطحة, اتصال لاسلكي بشبكة الإنترنت (مجاني), غرف لغير المدخنين, مكيف هواء, تدفئة لمساعدتك على استعادة طاقتك بعد يوم طويل. كما أن مجموعة الخدمات الواسعة الموجودة في الفندق لضمان راحتك تترك لك الكثير من الخيارات لقضاء وقتك أثناء فترة إقامتك. استمتع بخدمات لا يعلى عليها وعنوان ذو اعتبار في منتجع ذا ويف . ثمة حد أقصى للتحميل وهو 500 ميجا بايت في اليوم. يلزم دفع مبلغ تأميني مسترد قيمته 500 دولار أسترالي عند تسجيل الوصول، وذلك عند إشغال غرفة صب بنتهاوس المكونة من 3 غرف. إذا كان النزلاء بحاجة إلى نوع سرير محدد، هناك رسوم لمرة واحدة بقيمة 30 دولار أسترالي. يخضع الجزء الخارجي من مكان الإقامة لأعمال طلاء من 27 مايو 2019 حتى 19 يوليو 2019. لا تتوفر الشرفات والمسبح ومنطقة الشواء في الطابق الرابع للنزلاء من الساعة 7 صباحًا حتى الساعة 5 مساءً في أيام الأسبوع. لن يتمكن النزلاء على استخدام الشرفات الخاصة بهم، ومع ذلك سيكون المسبح ومرافق الشواء في الطابق الـ 34 متاح للاستخدام خلال هذه الفترة. لطرح أي استفسارات أخرى، يُرجى الاتصال بالعقار مباشرةً. 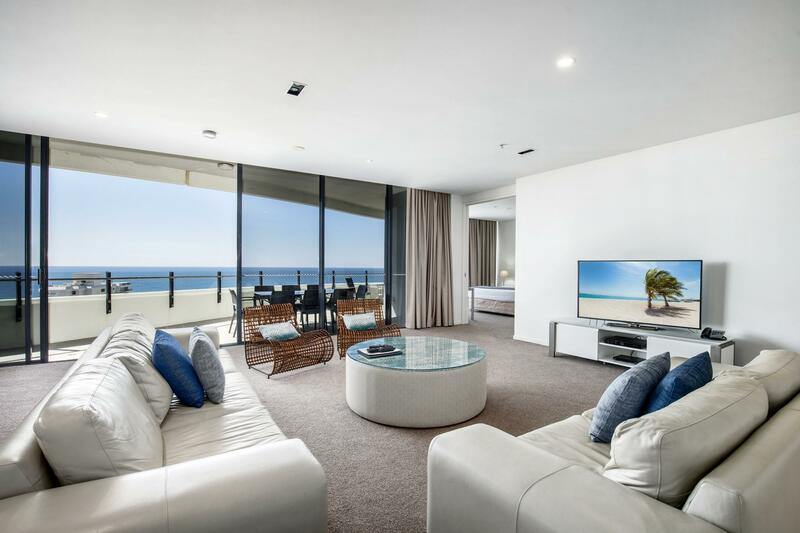 Walking distance to the beach and pacific fair shopping Centre, casual 4 km walk to surfers paradise, we had the ocean view apartment on level 28 and what a view from our massive balcony to see the midnight NYE fireworks! We most definitely be back. Thank you for an amazing holiday!!!!! We stayed in a great one bedroom apartment on the 9th floor of the building. The apartment was really spacious and ideal for our 11 day stay. We got a bit of a view which was nice and I’m sure that would improve as you go up the building. There are two pools, the main on the 4th floor and the another on 34th floor. The top one is tiny with only 4 sun loungers, that is no problem except for the fact that it kept on being over run with small children. It really isn’t an appropriate space for kids play. It would be good if this pool was an adults only space. The gym is a really great facility and is better than most hotel gyms I have been in before. The staff were really great, and whilst we didn’t need much from them were super helpful when we did. I would happily recommend this facility to anyone and would certainly head back again in the future. 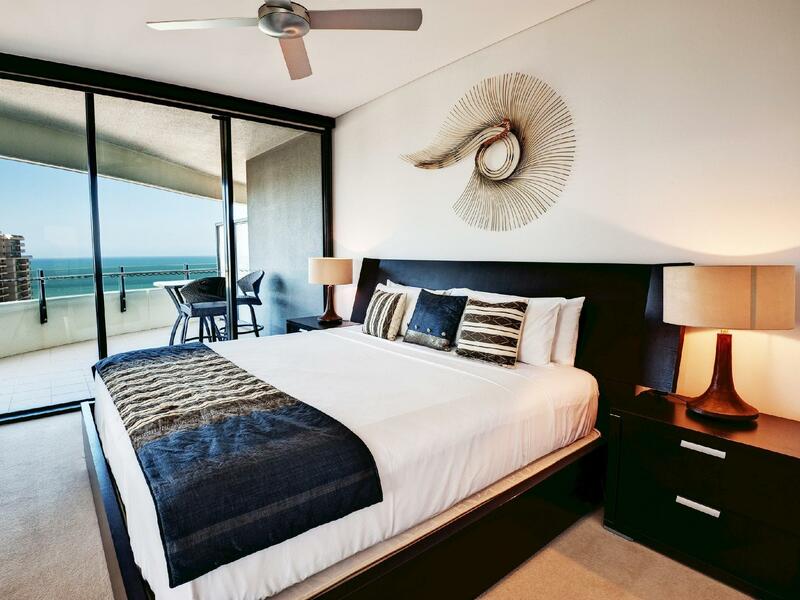 30th floor with wide views of the ocean coupled with a really comfortable, clean,modern apartment and you can't go wrong. the staff were friendly and nothing too much trouble in this conveniently located resort. We have stayed at The Wave Resort numerous times and it never disappoints. Quiet, views for miles, close to everything we need, so much going for it. We stay for Blues on Broadbeach and all we have to do is walk out the front door and we are part of the festival. 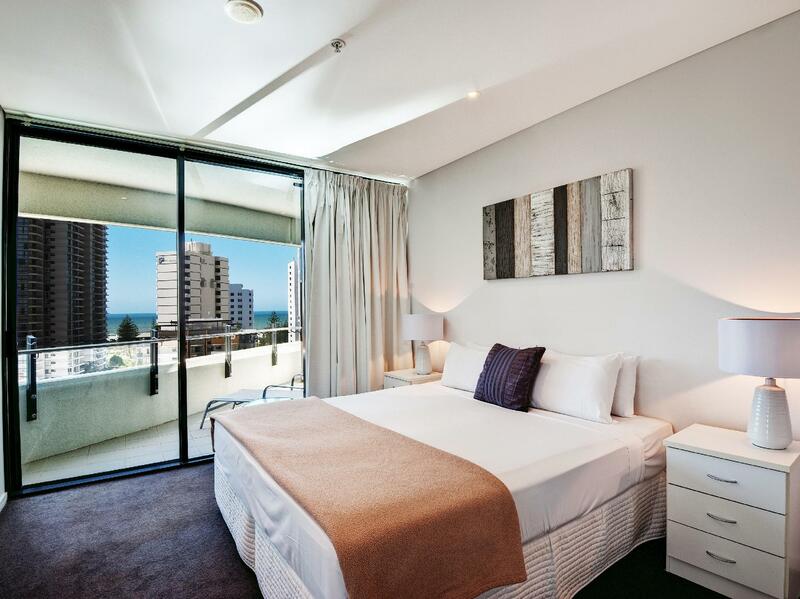 Great central location in the heart of broadbeach. Everything you need is on your doorstep - restaurants, bars, supermarket, shops, beach We thought that being so central it would also be noisy but it wansnt The case. we were only on level 7 and had no issues getting to sleep. Free parking was a bonus but on two occasions someone had parked in our allocated spot :( All in all a great stay Would definately stay here again! This is my second stay at The Wave. Fantastic 3 bed apartment very clean, modern, well stocked and maintained. Love the pool and the gym. 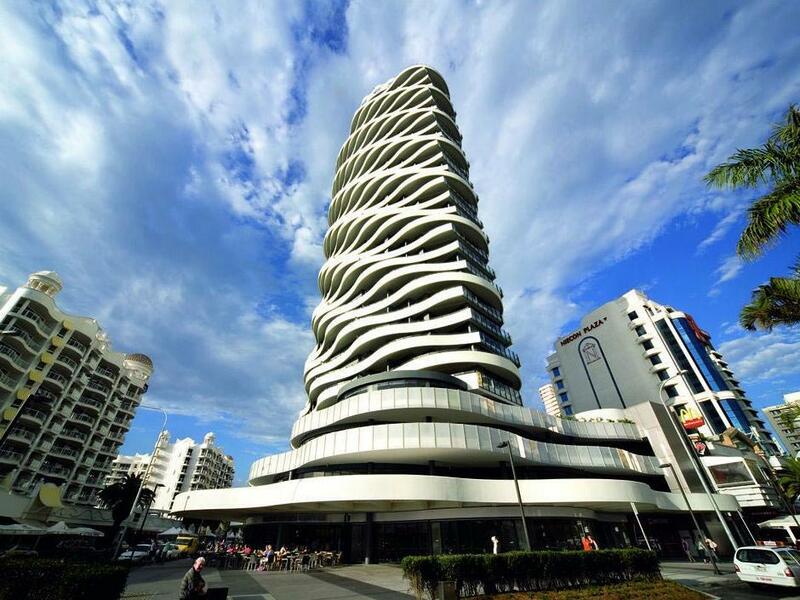 Great location, lots of cafes and restaurants and a supermarket close by. Quick drive to pacific fair. Staff very friendly and helpful. I had stayed here before and rated the resort highly and it didn't disappoint. The resort is exceptionally clean and well cared for. 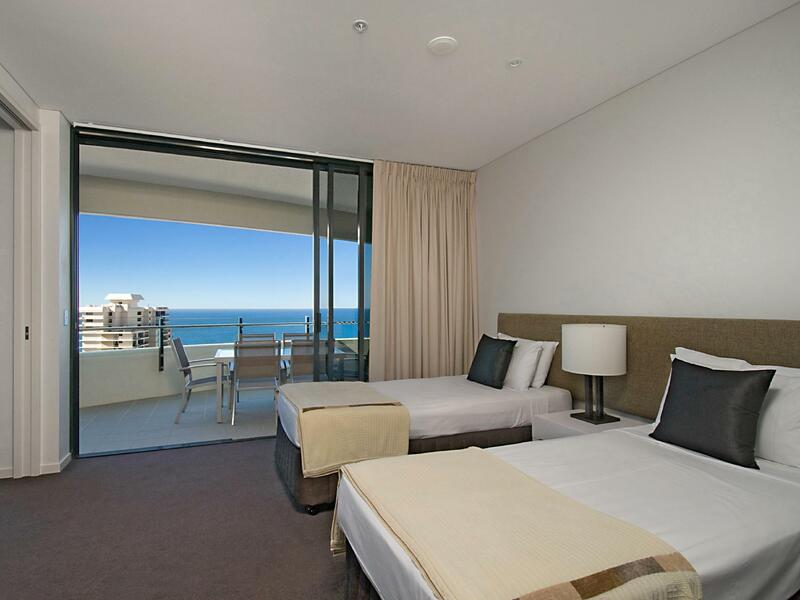 The rooms are spacious and comfortable and offer large balconies with exceptional views. All the facilities you could want to relax while on holiday and is walking distance to shopping, restaurants and the beach. The staff are professional and efficient at check in and helpful when you need assistance. Complimentary parking and wifi are a welcome bonus. Love this resort and look forward to my next stay. Highly recommended. This is my third stay at this hotel. In a top spot in Broad Beach straight above some great restaurants and bars. Rooms are always really clean and in good working order. Comfy beds , Roof top heated pool an spa are great as there was a cold snap the week I recently stayed. Lower level pool is great for kids with a heated pool right beside it on the cooler days. Think my last room was on level 11, tho there are good ocean views from the side directly in front is a not so attractive building that really wrecks the views. Pick a higher floor if possible, overall a great stay and would recommend this hotel. This is the second time I stayed here. I came back because the location is fantastic. It's right by the beach and near to Pacific Fair as well as supermarkets. It is fully equipped with kitchen facilities and laundry and washer. The rooms are a great size and come with great wardrobe space as well as comforters and blankets. The only issue I had was wifi! It was tough to connect to 4g and wifi was not free after a certain quota. We were really happy with the apartment. The pools and spas were lovely, wifi was included. Excellent acces to conference centre. We did find it noisy though. We were on the 12th floor and was really surprised by the amount of night life noise which came in to the room, even on week nights. Apartment was relatively quiet considering we were put on level 5 as pool area is level 4. Everything in apartment that we needed. Most comfortable was our second stay here and would definitely stay again. We thought the lighting was a bit dim. Not enough of it especially in bathrooms. Strange placing of plugs for electrical equipment to be used in bathrooms. We had to take keys to empty rubbish. Keys jammed in lock every 2nd time that it was used. Dangerous. Someone can be locked outside for quite sometime. Not enough towels - (only 1 towel p/person allowed); 2 towels p/person minimum should have been allowed. If one wants to take a shower in the morning, and because weather was so humid and hot, one would take a shower in the evening, but would have to wait for washing and drying of towels to do so. This would be wasting more water as only 2 towels per wash. Apart from all above, the views were magnificent, and right in the heart of city, walking distance to everything. Pool areas clean and big enough. For the apartment that we had I would rate it 3.8. Not quite a 4 Star. Perfect position and so central! 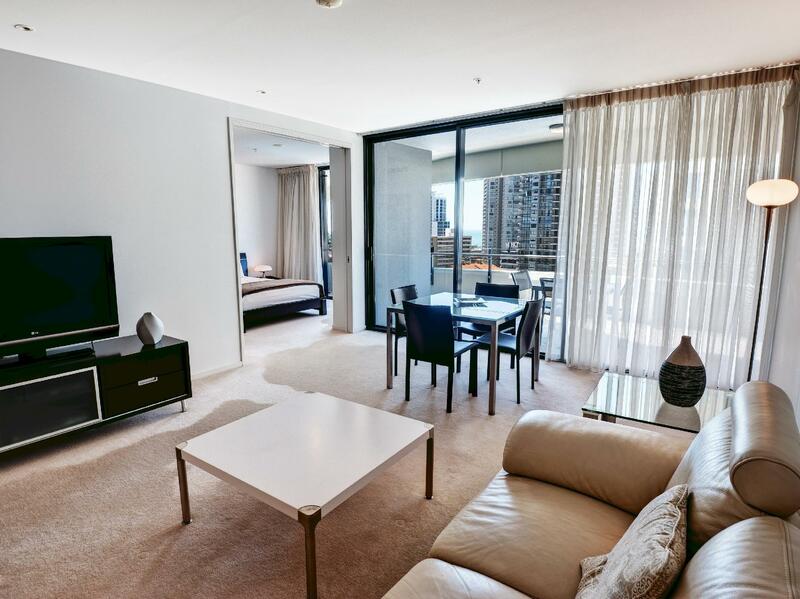 Generous sized apartments, very clean and super comfy bed! I slept better at the wave then what I do at home! We loved it and will definitely be back!